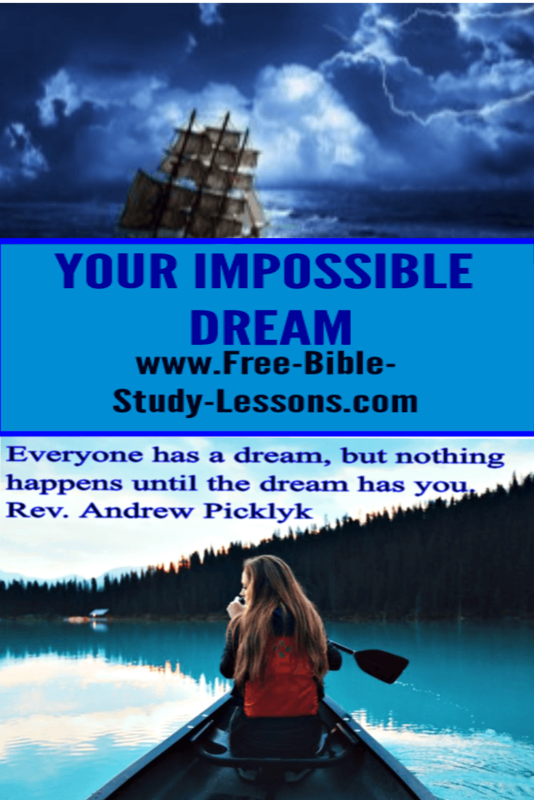 Has God given you an impossible dream…or is there some deep desire stirring in your soul? Does it challenge you? Does it scare you? Do the problems seem overwhelming like giant waves seeking to capsize your little boat? Sometimes we get the impression that the Christian life is supposed to be smooth sailing. In this story the disciples had obediently followed the words of Christ, and where are they? In a boat in the middle of the sea during a storm. At any moment, they could be capsized and drowned. Most of these men were experienced seamen. They knew when the danger was real. Death was hovering near - from the viewpoint of natural eyes. The boat, although tossed and in danger of sinking, still represented some measure of control. They could turn the rudder or bail out the water. It wasn’t much, but there was still some sense of natural control. Even as Christians - in sometimes sinking boats - we want to have some sense of control or natural security. But impossible dreams do not happen in the realm of natural control or possibilities - otherwise they would not be impossible dreams. In the boat is where there majority of disciples stayed - knowing the danger, but feeling some small measure of control. This is also where the majority of Christians live. [Many who only name the name of Christ have never obeyed Him long enough to get in the boat!] They have obeyed Christ. They are out on the waves doing what He has told them to do. Nothing wrong with that. It takes faith to be there, although still - in some measure - relying on natural resources and strength. Peter dared to dream an impossible dream and think beyond where anyone else was. If Christ was walking on the water, then that is where he wanted to be as well. It is faith that pleases God and Peter had faith for great things. Peter did not just have an impossible dream, he did the impossible. Notice he didn’t just jump out of the boat. He did not know if it was God’s will or not for Him to walk on the water - so he asked. Sometimes we have an impossible dream, but we do not know if it is from God or something that springs from our own desires. We know that it cannot be done without the intervention of God. So what do we do? Ask! Then Peter waited until he got an answer. That is the difference between faith and presumption. Faith asks and waits for the answer. Faith knows in its heart - even if it cannot explain it - that it is something God wants done for His glory and the benefit of others. Presumption just jumps out of the boat demanding God respond to its willful actions. Presumption drowns, faith walks. In some of you God is birthing dreams. They are impossible dreams. They could never happen - not by staying in the boat anyway. Don’t act in presumption. Get the Word of God. Hear Him say, “Come” to you. Once God has said come, don’t delay and allow doubt to set in. Step out of the boat - you may have to leave fearful or doubting friends behind - and walk on water. The majority will never get out of the boat. If you are going to do great things for God, there are many times when you will walk alone. The cost is great. The storm will come. But the reward is great as well. As the pastor in my church pointed out, if we haven’t had to cry “Save me” we probably haven’t been walking on water. Yes, when we step out in faith we may start to sink, things may go wrong, we may do it wrong, we will have to cry, “Lord, save me. I’m in over my head.” Guess what, He always stretches out His hand and lifts us up. Remember, there’s no reason for God to get involved if we never step in the realm of the impossible. So what impossible dream has God placed in your heart? It’s probably for beyond your capabilities - because He wants to get involved and give your faith a chance to grow. Be a water walker.